Grew up… in Pittsburgh, Pa. Her biological mother died only recently, and her father has already moved on. Profession… carnival worker at Adventureland, Pittsburgh’s dreary pop-up theme park. 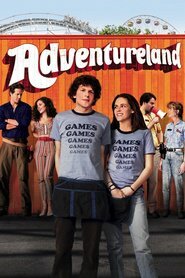 Relationship Status… involved in an affair with Adventureland’s maintenance man, Mike Connell. Em’s involvement with the older (and married) part-time musician isn’t really satisfying her. It’s also making her feel extremely guilty. Meanwhile she’s drawing sincere interest from her co-worker James, a recent college grad who knows more about dissertations than dating. Challenge… leaving her toxic relationship with Connell. Em wants to avoid her home and her stepmother at all costs, so has been spending time with Connell in his mom's basement. I’s hard to picture this relationship ending well for anyone. Personality… wry, sullen and world-weary. The cynical Em, who rarely cracks a smile, is beginning to show her lighter side after she meets her innocent co-worker, James. Maybe James can help break her out of rut, if only he can learn to get out of his own way romantically. Em Lewin's popularity ranking on CharacTour is #1988 out of 5,000+ characters. See our top-ranked characters and read their profiles.